In my complete refitting of Oystercatcher, my Ericson 25, I knew I wanted to replace the existing cushions, which were now some forty years old. I was not sure, though, if the new cushions should have the same configuration as the originals. 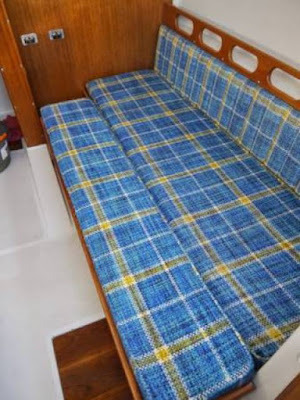 Specifically, I wondered if it would be better to have two separate seating cushions on each side of the boat rather a single slab seating cushion. 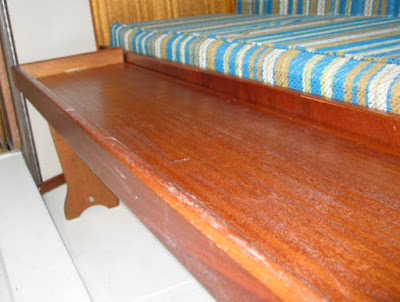 In this posting I discuss problems with the original cushions and I explain why I ultimately decided to abandon the single slab seating cushion approach I found in the original. The fabric for the original cushions was Golden Rod Plaid, a color and a design that was popular in 1975, the year in which Oystercatcher was born. Some in the early 21st Century might find this color and style appealing for its vintage feel. I, though, did not. I preferred the classic, navy blue color common to wooden sailing ships of old. I was, after all, inspired to purchase Oystercatcher because of my experience on tall ships. The foam for these cushions was not robust. It offered little comfort to the hindquarters, and besides, it had experienced water intrusion over the years from the leaky portlights that stood above the cushions. This water intrusion had even affected the backrests. The plywood foundations of the backrests had absorbed some of the water and had become brittle from rot. The V-berth cushions were in better shape. These cushions in the V-berth, however, just like the cushions in the main salon, did not have cloth on their bottoms side but vinyl. This vinyl would trap moisture and not allow the cushions to breath. So yes, I knew I wanted to replace the existing cushions, but I began to wonder whether it would be better to alter the original configuration of the cushions in the main salon. I began to wonder whether I should have two separate cushions on each side rather than a single, slab cushion. My thinking was shaped by my concerns about the use of the four lockers beneath the settees. I wanted to have easy access to each locker. A single, slab cushion would be difficult to pick up quickly and move out of the way. Adjacent to the galley sink was an icebox. I had no plans to use this for food. There was not enough foam insulation around it to make it effective. I decided I would use it as a pantry for the storage of dry foods. It was deep and spacious. I experimented with ways I might stow the dried food in plastic containers. I did eventually use this space for the stowage of dried foods, but I never used the plastic containers. It was easier to put the foods in ziplock bags, and it allowed for the stowage of far more food. In lieu of using the icebox for the stowage of refrigerated foods, I decided to use a cooler, one that I would stow on the settee in the main salon. I had seen one other Ericson 25 owner online who had done the same thing, and this seemed like a good idea. This led me to purchase a Yeti brand cooler. These Yetis are well insulated and can keep food colder much longer than your average cooler. This particular model was the Yeti Tundra 75. One of the drawbacks to the Yeti was its size. It made for a tight squeeze between it and the main salon table. I experimented, placing it in various locations atop the settees. One thing I had to consider was the loss of one settee. This meant that this boat could only sleep two persons, one in the V-berth and one on the single available settee. In an effort to remedy this potential situation, I experimented with places I might stow the Yeti cooler at night to allow both settees to be used as bunks, thus allowing 3 total persons to sleep on the boat - two on the settees and one in the V-berth. I eventually decided that the forward end of the port side settee was the best place for the Yeti to sit on a regular basis. This meant that in new settee cushions - at least the one on the port side - needed to be not a single slab, but two separate pieces. I decided it would be smart, however, to go ahead and have both sides - port and starboard - made with two separate cushions. This would give me flexibility in terms of where I might wish to place the Yeti cooler. This was a smart decision. I can say now, over three years after the fact, that I love the flexibility of having four separate cushions on the settees, if only because they allow for easy access to the settee lockers, which, when cruising, I access every day, often throughout the day. My thinking at the times was that if I dropped one side of the main salon table there would be plenty of room to walk back and forth. I planned to install straps to hold the Yeti down to the top of the settee. If I ever wanted to lower the center of gravity temporarily, I figured I could drop the Yeti down into the slot between the settee and the table. My Ericson 25 did not have the starboard side settee berth extension that had been an option from the manufacturer in 1975. I knew an Ericson 25 owner who had one. He no longer needed his, because of modifications he had made to the main salon of his boat. He offered to give it to me, since we had gotten to know each other well from telephone conversations and emails over the years. I needed to figure out if I could even use this berth extension with the main salon table that I had already constructed. Do to the sturdiness of its construction and the way I had firmly mounted it to the bulkhead, it could stand securely without one of its legs. The berth extension and cushion arrived via UPS with no cost to me but the shipping. Yes, the shipping wasn't cheap, but it was far cheaper than what it would have cost me to make my own out of mahogany. I also would have lacked a cushion. This berth extension would end up being one of the most valuable additions to the boat. It would allow me to sleep comfortably many a night. Now I needed to make precise measurements of the existing cushions. It appeared from a distance that these cushions fit quite well. They in fact did not. Either the foam had contracted over time (a likelihood), or they were a little short to begin with, or both. I, therefore, could not simply hand the upholsterer the cushions and ask for exact copies. The same held true for the V-berth cushions. There was a gap on the sides of the V-berth cushions. Notice the 1x4 board in the pictures above and below. There were also gaps on the aft end of the V-berth cushions. The forward ends also were short. It was clear that I needed to make all these measurements just right. This ends my account of the analysis I made with regard to the new cushions I planned to have made for Oystercatcher, my Ericson 25.